Interview with the Huffington Posts Brooke Roberts-Islam which you can read in full HERE or follow the story below. It’s a story of serendipity. Beatie Wolfe, singer songwriter and digital pioneer of the NFC-launched album Montagu Square met me at, well, 34 Montagu Square, to discuss a very peculiar and fascinating collaboration. I say very peculiar for more reasons than one. 34 Montagu square is the home of tailor and Anthony Sinclair Creative Director David Mason. The very same residence was home to Jimi Hendrix, John Lennon, Yoko Ono and Ringo Starr in the 60’s. It was also the recording place of Eleanor Rigby and a number of other era-defining songs by the Beatles and other seminal artists from the 60’s and 70’s. David tells me that the current owner from whom he leases the property outbid Noel Gallagher. Imagine the fallout. I was greeted at 34 Montagu Square by David Mason who recently acquired the rights to the Mr Fish label - a fashion brand famous in the mid 60’s to 70’s for dressing Mick Jagger, David Bowie, The Beatles and Jimi Hendrix and less famous for dressing David Hockney, Pablo Picasso and Princess Margaret. The role call of clients is astonishing. David is in the midst of relaunching Mr Fish (which we’ll delve into further in a future post) but today we’re talking about a collaboration he has just completed with Beatie and digital weaving pioneer Nadia Anne Ricketts, founder of Beatwoven. Beatie bumped into David at the Royal Albert Hall while attending a Michael Caine event commemorating the film Alfie - which Anthony Sinclair tailors created the suits for - and they got talking about 34 Montagu Square. David invited Beatie over for tea and to experience the fascinating story of the residence. This led to a discussion about Beatie performing in the flat and recording a track there. The idea of translating the track into a fabric came about later. It was the result of another chance meeting, this time between Beatie and Nadia at a book launch. Nadia was presenting her ‘Lucy In the Sky With Diamonds’ chair, which caught Beatie’s attention. Beatie and Nadia came up with the idea of weaving a fabric from one of Beatie’s tracks, which would then be crafted into a jacket befitting a rock star, by David and his team of Hackney Wick-based tailors. 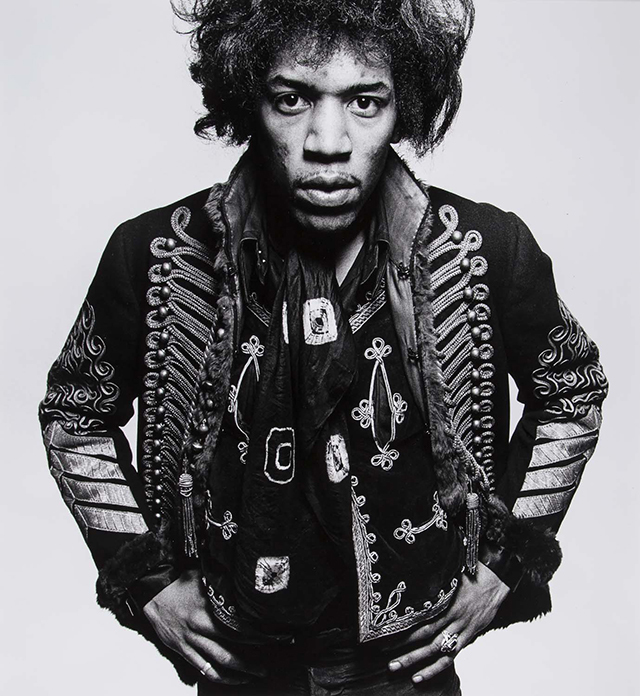 David was inspired by the military jackets made popular by Jimi Hendrix and particularly the strength of the shoulder line. Jimi’s signature collar features too. David’s tailoring is steeped in British history and culture, and the weaving of the fabric at a mill in Sudbury in addition to Beatie’s Brit singer-songwriter swagger makes this a very British collaboration from concept to completion. This collaboration was driven by creativity. There was no commercial aim, leaving the three collaborators to experiment with fabric selection and even change the garment from a gown to a jacket in the final few weeks of the project. The unveiling of the collaboration took place at an intimate gig at 34 Montagu Square and was subsequently launched at DLD in Germany, where Beatie spoke about her album and the serendipitous collaboration that arose from her chance meeting with David. Delving a little deeper into the fabric creation, Nadia explained that the resulting fabric is dependent on the frequency and ‘fullness’ of the track. Electro and synth-driven music leads to intense and densely detailed digital imagery in her customised software, which effectively creates a visual representation of the sound according to frequency and amplitude. Conversely, classical music, which tends to contain moments of little or no sound, creates sparser digital patterns. Nadia manipulates the patterns to create graphic visual effects that have a sensibility toward the final design and the inspiration. It’s a fascinating practice that arose from a passion for sound and dance and evolved from an analogue incarnation into a fully-fledged piece of software, to which she is hoping to add a customising functionality for her private clients. David explains the process of toileing and fitting that any tailor or pattern-cutter would be familiar with. The basted and canvas-lined toile remains in the Hackney Wick studio should Beatie request another bespoke jacket any time soon. David’s tailors crafted the jacket from the silk/cashmere/silver jacquard made in a satin twill structure requiring deft hands to control the movement and stability of the fabric. It’s like liquid gold and my experience tells me it would have been a difficult fabric to work with - which David confirms. The final result is a digi-inspired piece of cultural history. Inspired by Beatie, translated by Nadia and crafted by David. It’s a beautiful creation that transcends each of them as individual artists and creatives and tells a story about British craftsmanship and the power of musical culture. The Institute of Contemporary Art, Boston has expressed an interest in exhibiting the piece, which further illustrates the significance of its craftsmanship and powerful storytelling ability. Rhythmic moments in time distilled into a fabric and crafted into a piece of sartorial history - this is more than fashion, more than music and more than technology. The sum of these parts is enlightening, inspiring and unexpected. 34 Montagu Square has a magical quality, says Beatie. “ There’s something about this room”. I tend to agree.